Wahama’s Brodee Howard clears an obstacle as Point Pleasant’s Kaydean Eta gives chase during the 110-meter hurdles event held Friday at Laidley Field in Charleston, W.Va.
CHARLESTON, W.Va. — A big night for the Black Knights. 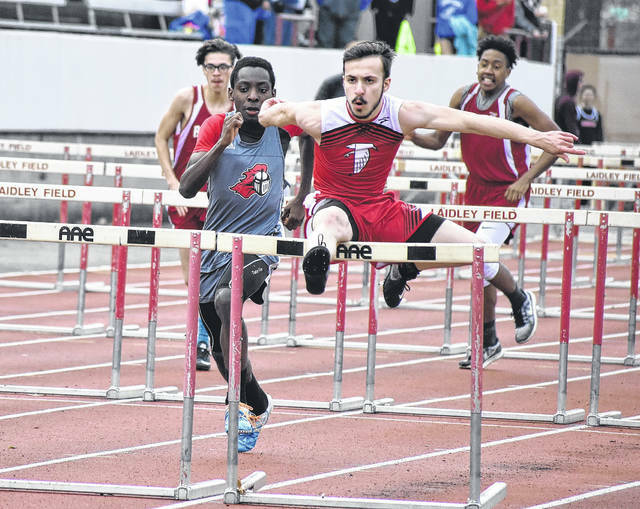 The Point Pleasant boys track and field team joined the East Fairmont girls on Friday night by coming away with top honors at the 2018 Herbert Hoover Invitational held at Laidley Field on the campus of the University of Charleston. The Black Knights came away with two event titles and a dozen top-six efforts en route to posting a winning score of 67 points, which was just three points better than the rest of the 17-team field. Ravenswood was the boys runner-up with 64 points, while Capital placed third with 57 points. Wahama also competed at the event and finished tied for 11th with Braxton County with 18 points. Luke Wilson led PPHS with a pair of winning efforts in the 1600-meter run (4:44.13) and 3200m run (10:13.08), while Zach Rediger was the pole vault runner-up with a cleared height of seven feet even. The quartet of Brady Adkins, Josh Wamsley, Zac Samson and Jovone Johnson placed second in the 4x200m relay (1:39.30), while the foursome of Adkins, Rediger, Kaydean Eta and Logan Southall were the 4x110m shuttle hurdles runner-up with a mark of 1:08.69. The 4x400m relay team of Wamsley, Samson, Adkins and Cason Payne placed third with a time of 3:50.24, while Jesse Gleason was third in the shot put (39-5) and fourth in the discus (118-9). Adkins, Wamsley, Southall and Johnson finished fifth in the 4x100m relay with a time of 47.48 seconds, while Eta was fifth in the 110m hurdles with a mark of 18.12 seconds. Alex Gibbs (36-9) and Trevon Franklin (36-1) also placed fifth and sixth, respectively, in the shot put event. The White Falcons landed one event champion as Johnnie Board captured the pole vault crown with a winning height of eight feet even. Brodee Howard was also the 110m hurdles runner-up with a mark of 17.16 seconds, exactly one-one thousandth of a second behind the eventual winner. On the girls side of the meet, East Fairmont beat the 15-team field by nine points after posting a winning tally of 86 points. Sissonville was the runner-up with 77 points, with the Lady Knights right behind in third with 74 points. The Lady Falcons were also 13th overall with 13 points. The Point Pleasant girls came away with five event championships and a total of 10 top-six efforts, which also included a pair of runner-up performances. The quartet of Sami Saunders, Teagan Hay, Madison Hatfield and Lexie Wray won the 4x100m relay with a time of 55.35 seconds, while Hay, Hatfield, Wray and Allison Henderson combined on a time of 1:58.25 to win the 4x200m relay event. Henderson was the 800m champion with a time of 2:40.63, while Saunders won the high jump (5-2) and placed second in the pole vault (8-0). Hay was the 200m dash champion with a mark of 29.34 seconds, plus she also finished fourth in the 100m dash with a time of 13.86 seconds. Hatfield was the 400m dash runner-up with a time of 1:06.72, while Hannah Gleason picked up a pair of fifth-place finishes for PPHS in the shot put (25-8½) and discus (75-10½) events. The Lady Falcons came away with a pair of top-six finishes, which included a runner-up effort from Camryn Tyree in the long jump with a distance of 12 feet, 6½ inches. MacKenzie Barr also tied for third in the pole vault with a cleared height of 6 feet, 6 inches. Visit runwv.com for complete results from the 2018 Herbert Hoover Invitational held Friday at Laidley Field.